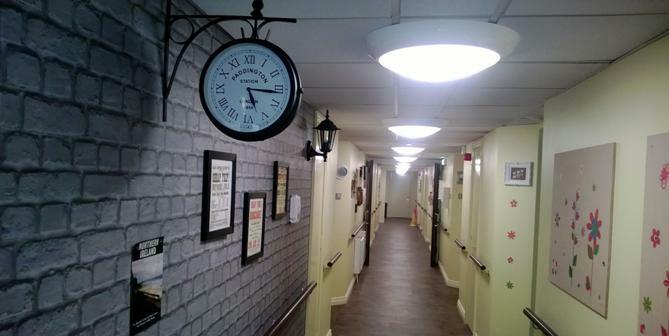 Kirk House has now completed adapting one corridor into Memory Lane, which will provide care for people living with dementia. This corridor consists of nine flatlets which are the same size and layout as the flats in the main building but have been refurbished with design features to support research-based approaches for people with dementia. The adaptation has been made using the University of Stirling’s Dementia Services Design Centre (DSDC) Design Audit tool, which ensures current research is adopted. The décor of the flats uses a green colour palette and incorporates the use of contrasting colour to enable way-finding for the resident. Internal doors have been removed from both the entrance hallway and the kitchenette to reduce confusion and help residents identify where these areas are. Additional lighting has been installed to help compensate for some of the visual disturbances common in dementia. As some people can be troubled with increased confusion at night time, often associated with needing to use the bathroom, the lighting in the bathroom has been fitted with a timer which enables the light to be programmed on an individual basis for any resident that has this difficulty. A unique design feature has been added which is a ‘quirky’ glazed panel placed on centre in the upper door, just enough to allow the light to show through whilst looking like an interesting décor approach. All of the front doors into the flats have been painted different colours to help each resident identify their own personal flat. The door can also be personalised with the residents choosing a number that is significant for them. For example if they always lived at No 110 then this can be fitted. Also any personal choice of door knocker can be added. Work has also been completed on the communal corridor, bathroom and lounge/dining area as well as the creation of a unique safe and secure outdoor space. The corridor has a new entrance door which has the facility to lock. However, our approach to care means that this door will not be routinely locked on a daily basis and only used at times when residents are particularly distressed. From the inside of the unit the door is concealed so it is not an obvious exit and is located beside a new door leading to the garden. This should promote resident’s choice to enter and exit the building but enable them to do so within a safe and secure area. In addition a new ‘reading nook’ has been created to provide an extra semi-private area for residents and relatives. The lounge, dining and kitchen area have also been renovated to meet the dementia design audit recommendations and new patio doors have replaced the bay window to provide additional access to the outdoor space. Additional lighting has been installed throughout the unit. A separate staff call system has been installed to ensure residents in Memory Lane have direct access to the dedicated staff team there. The staff team for Memory Lane have all completed the DSDC ‘Best Practice in Dementia Care’ development programme. This is a significant course of study which is run over a six month period. 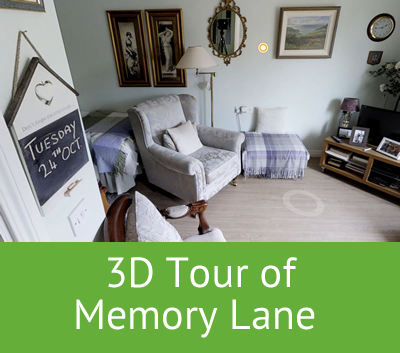 The staff working in Memory Lane are all committed to providing a true ‘home’ for the residents and the flexible approach to the day enables a true person-centred approach to be adopted. Relatives are supported to develop Life Story memory books with their loved ones. This helps staff to gain a better understanding of the individual’s life history, interests and past events. Singing and laughter are heard throughout each day in Memory Lane. For further information on Memory Lane please contact The Manager on 028 9040 2938 or click here.